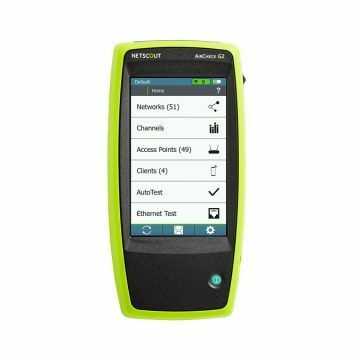 WiFi Analyzer is a leading troubleshooting and auditing tool for wireless networks manufactured under the brand AirMagnet, a part of the NETSCOUT company. With a colourful interface WiFi Analyser allows you to see how the wireless environment is configured, how it is secured, who is using it and what speeds are being obtained. Plus signal strength, interference, which channels are in use and many other metrics. This is coupled with AirMagnet’s unique AirWISE® engine, which automatically detects the root cause of dozens of security and performance problems. The rich feature set allows AirMagnet WiFi Analyzer to help IT staff quickly solve end-user issues while automatically detecting security threats and wireless network vulnerabilities. 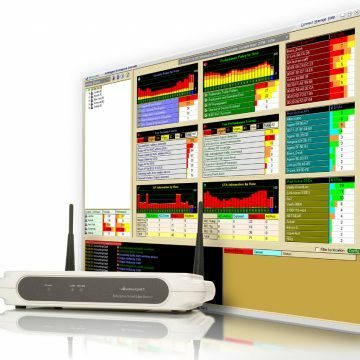 Furthermore, WiFi Analyzer enables you to easily test and diagnose dozens of common wireless performance issues including throughput issues, connectivity issues, device conflicts and signal multipath problems with a fully built in reporting engine to allow you to produce professional reports around compliance and policy based against industry regulations. 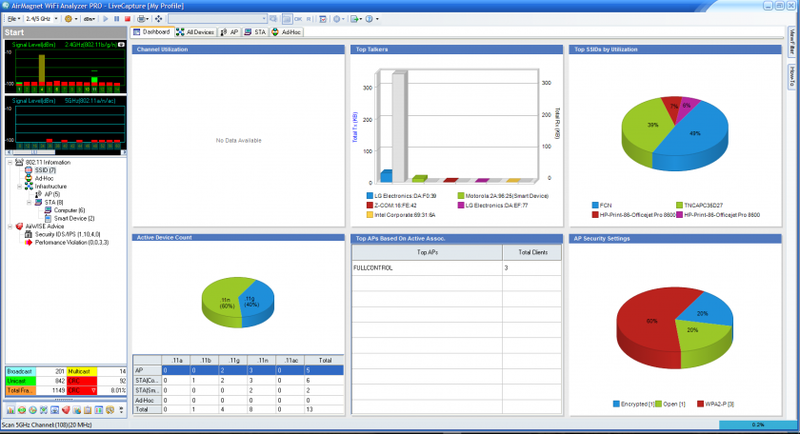 Also built into the product is a comprehensive reporting engine that allows you produce professional level reports based upon your wireless security, compliance or usage. As a software solution, please check the system requirements and supported adapters on NETSCOUT’s website. Delivery: AirMagnet WiFi Analyzer is delivered as an electronic licence typically within 7 days from order placement. AirMagnet WiFi Analyzer’s dashboard provides a live snapshot into the overall health of the WLAN network and helps users focus on top issues that need immediate attention to ensure maximized WLAN security and performance. Users are powered with a variety of charts, including ones for channel utilization, top talkers in the network, WLAN interference levels, mis-matched configurations, overloaded APs, security and performance problems, etc. 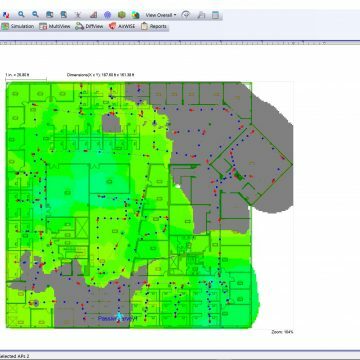 Users can drill down for deeper investigation into WLAN statistics for every device, channel and wireless frame. The AirWISE® engine automatically detects the root cause of dozens of WLAN issues across the spectrum. AirWISE® eliminates the need for users to manually interpret complex packet decodes and wireless data by taking the proactive role of identifying and explaining more than hundreds of threats and performance issues before they impact the network. The user-friendly AirWISE® interface explains alarms in straightforward details, provides access to additional diagnostic data, and offers advice on corrective actions. AirMagnet WiFi Analyzer automatically detects and alerts the user to dozens of wireless intrusions, penetration attempts and hacking strategies including rogue devices, “stumbler tools”, devices sending unencrypted data and a host of potentially damaging security configurations. These proactive measures enable IT to take corrective action before a problem occurs. The PRO version additionally detects sophisticated wireless attacks against the network. The AirMagnet WiFi Analyzer Find tool locks onto rogue or policy violating APs or stations and guides the user to their physical location. AirMagnet WiFi Analyzer provides in-depth frame statistics for every channel and device operating in the spectrum. With the channel utilization and throughput trending graphs, users can solve many of the issues that lower the overall performance of the WLAN network. Users can view trending graphs for signal strength, noise, frames, errors, retries, bandwidth and many more for every WLAN channel and device. 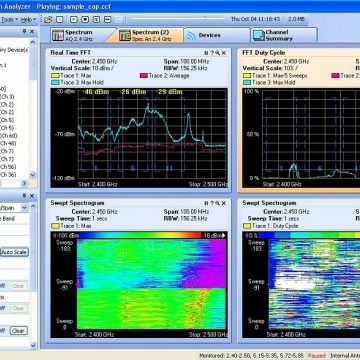 AirMagnet WiFi Analyzer PRO includes a suite of active troubleshooting tools and are available at the user’s fingertips to quickly pinpoint and solve wireless network problems. Wi-Fi interference occurs due to co-channel/adjacent channel interference from the corporate or neighbor’s WLAN, hidden nodes in the environment or non Wi-Fi devices operating in the 802.11 band. AirMagnet WiFi Analyzer includes a new toolkit to walk users through 802.11n optimization and troubleshooting. AirWISE® automatically detects and explains the 802.11n and 802.11ac network misconfigurations.